I like how Roach from the original makes a cameo at the 44-second mark of the trailer. What I don't like though, is the general mindset of these criminals in 2015. 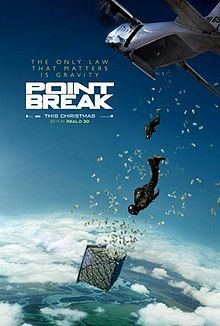 In the Keanu/Swayze Point Break, the guys robbed banks to pay for their surfing habit. In this version, they're trying to reset the world's economy, just because (or so it appears). I'm not a fan of the whole "destroying money instead of stealing it" concept--it's very Fight Club/Die Hard 3-ish. But at least in Die Hard 3, the villain only pretended to blow up the gold, then really did try to steal it after all.